Harry Truman said, "The buck stops here!" Good advice for an artist like myself. My Father took me down to Union Station in Cheyenne, Wyoming to hear his famous underdog whistle stop campaign speech in 1948. 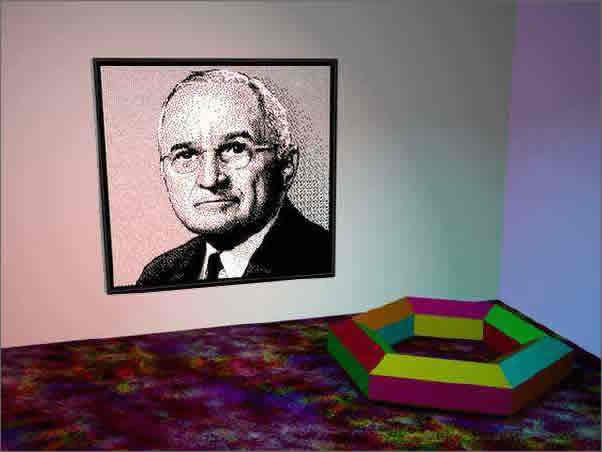 The Truman Image is an old piece of Clip-Art that has been on my hard drives for at least ten years, and I texture (bit) mapped it onto the wall in a Presenter 3D virtural room because I like Truman. He was a great President.